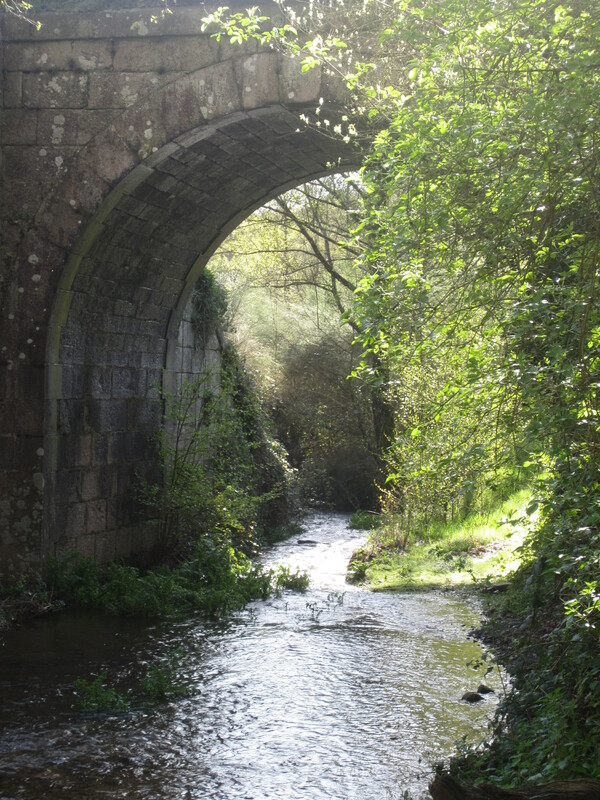 It was supposed to be a short walk from Palas de Rei to Melide, only 15 km, a welcomed break from our 20 – 25 km daily average. 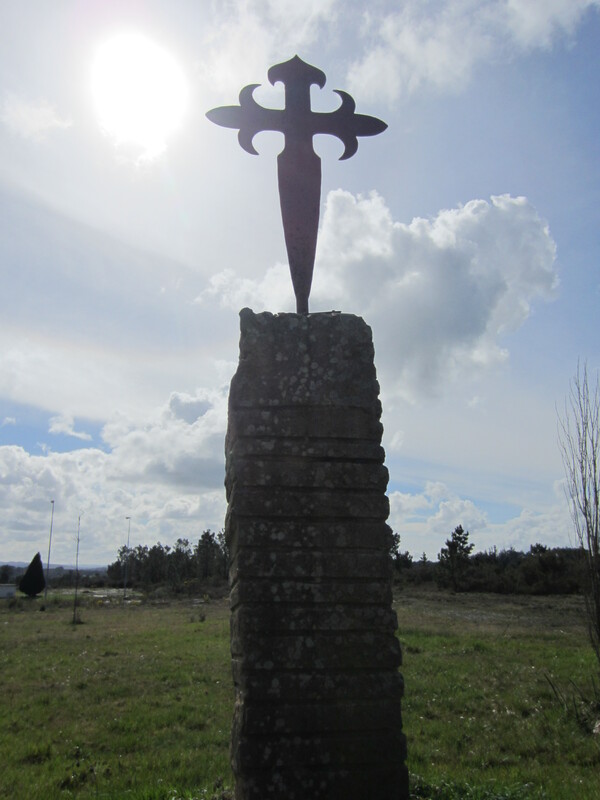 Alas that was not to be and for that we blame John Brierly, author of A Pilgrim’s Guide to the Camino: St. Jean – Roncesvalles – Santiago, the guide-book we read each night in preparation for the road ahead. 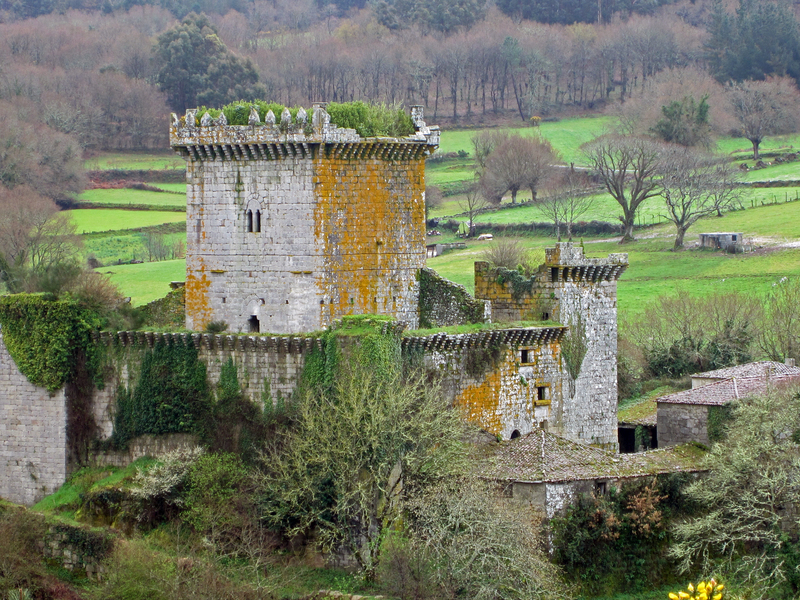 That day, the “guide-book” suggested a “quick” side tour to Castillo Pambre, a well-preserved 14th century castle just a few kilometers off of the Camino. As a former boy scout, my husband prides himself on his navigating/map-reading skills and so although he never seems to be able to remember how to get from our house to the mall, when on vacation I let him navigate – all part of my need for adventure. For reasons I should really not elaborate on other to say he was distracted by mother nature not so much calling as it was persistently yelling, we missed the critical turn to the castle road. The book however, showed a second road we could take and my husband assured me (after a quick stop in the woods) that it would only add “a little” more to our walk assuming of course the road was where it was supposed to be – it wasn’t. After walking back and forth along the same road for a while, while cursing at John Brierly’s lack of appropriate mapping, my husband decided to use his phone’s GPS to locate us and the road. Finally through the miracle of modern technology we found that we were standing right next to it. 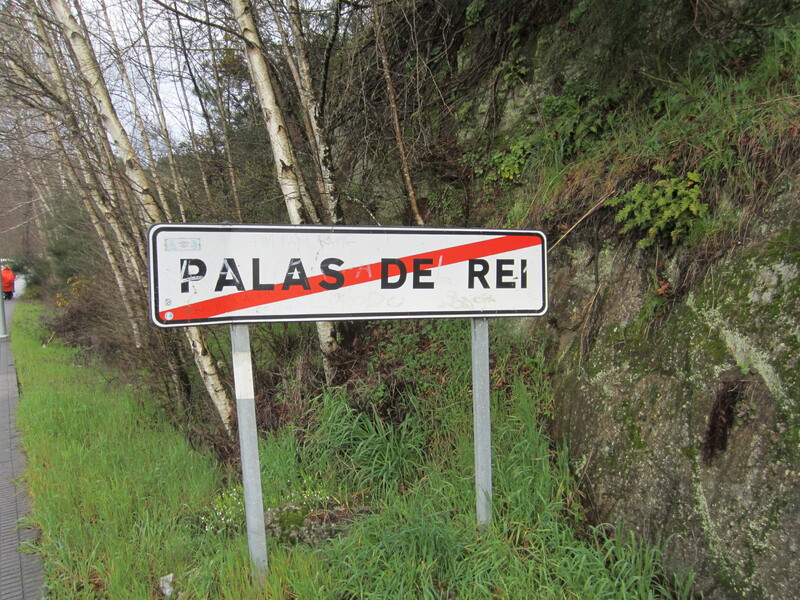 This is the road to the castle? Having spent more than two hours looking for this road, a little mud was not going to deter us from our mission and so we pressed on relying now on our GPS and not JB’s (what we came to call John Brierly) map. 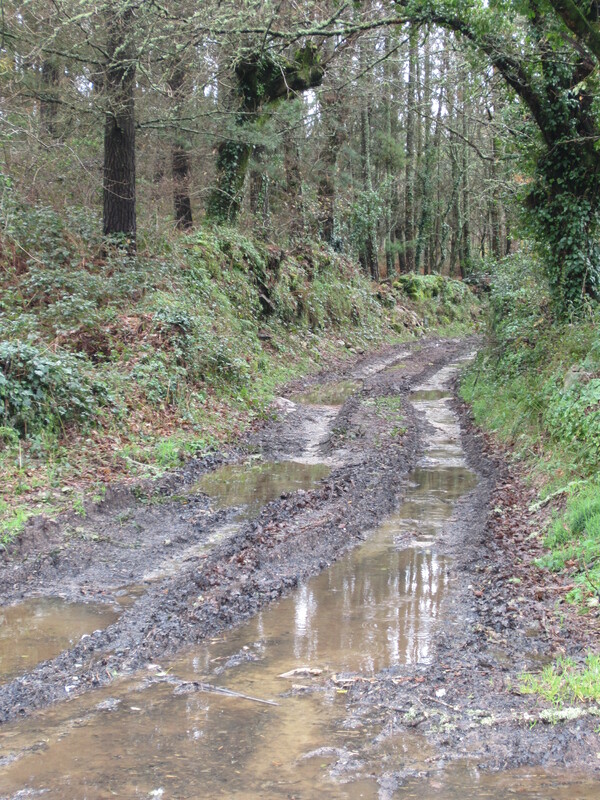 The GPS said take the muddy road – so we did. The GPS said to go up through the trees – so we did. The GPS said take the road long forgotten by man – so we did. The GPS said it would be right in front of us in the next hundred yards and it was – ON THE OTHER SIDE OF THE RIVER! Looks like no one has been on this road in a while – are you sure? A view from the BACK SIDE of the Castle. We are probably the first to see it from that side – EVER. 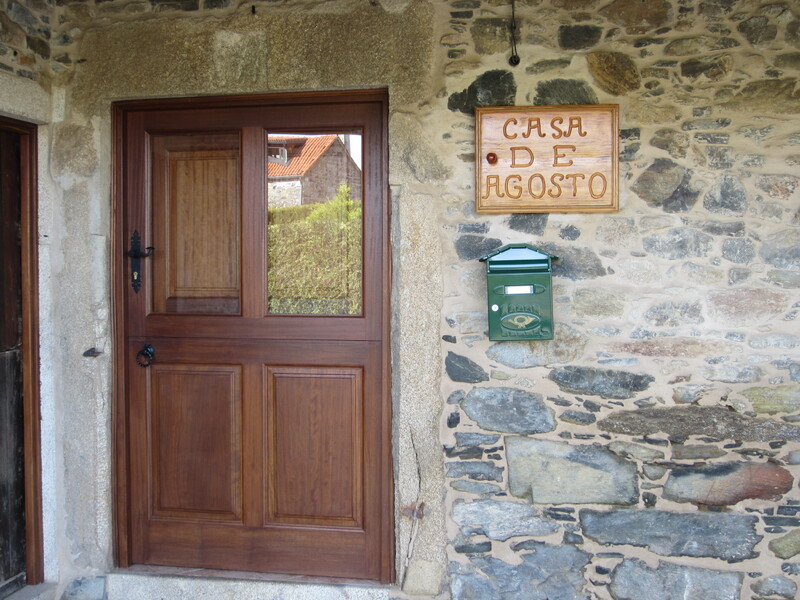 Back on the Camino (4.5 hours later), like a sign from our Gus that he’d enjoyed our shenanigans and was beckoning us to take a break, the very first house we came across was called the “Casa de Agosto” – (August’s House) and conveniently attached to the local “taberna” (pub). We took Gus’ advise, taking a break from our walk to visit the local church where Jesus appeared to be reaching down to hold us and lit a candle for our boy. 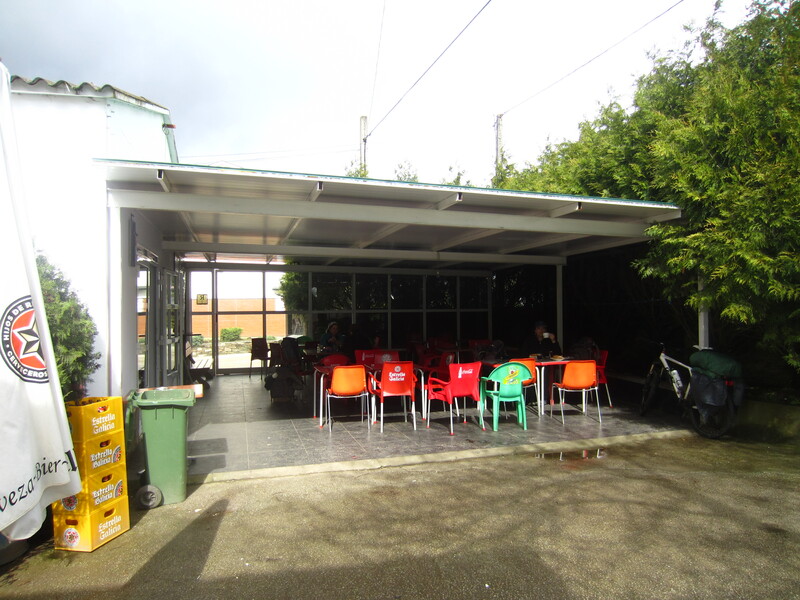 We then kicked up our feet and indulged in a beer (or two) before continuing on. A candle for our baby. 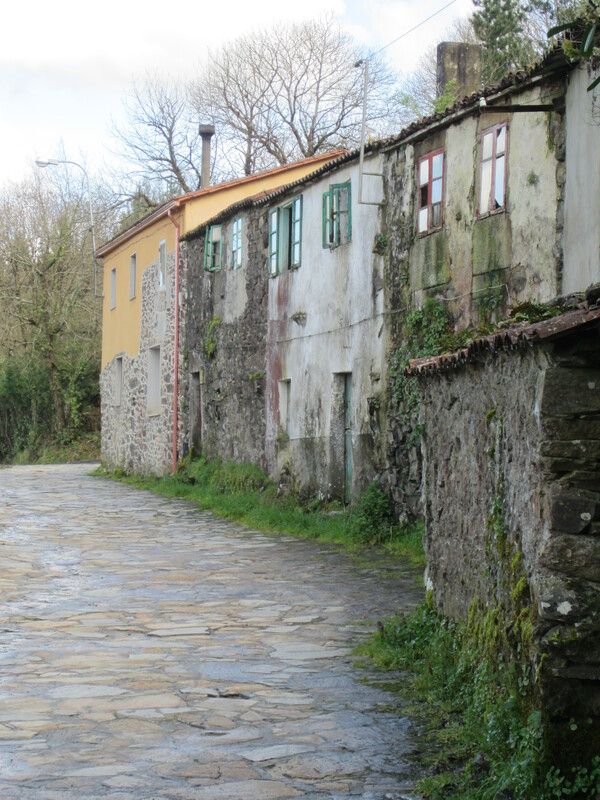 When we finally arrived in Melide, 10 hours and 26 kilometers later, having traversed through mud, trees and beautiful little medieval hamlets in the off and on rain, we were greeted by some of the nicest people at our surprisingly modern hotel. 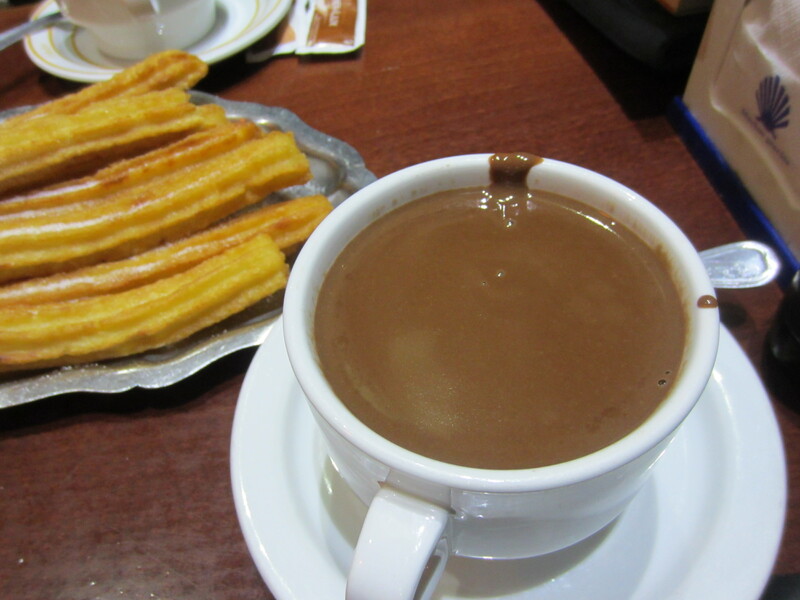 After pointing us in the direction of a delicious pilgrim’s meal consisting of more octopus, potatoes and wine, the managers of the hotel promised that the next day’s breakfast would consist of a steaming cup of hot chocolate and the best churros we ever tasted. They were right. Thank you St. James! It turned out that St. James forgot about our request for good weather and about mid-way along our seventeen mile trek, the heavens opened up on us enough that we had to stop several times to the let the worst of it pass. 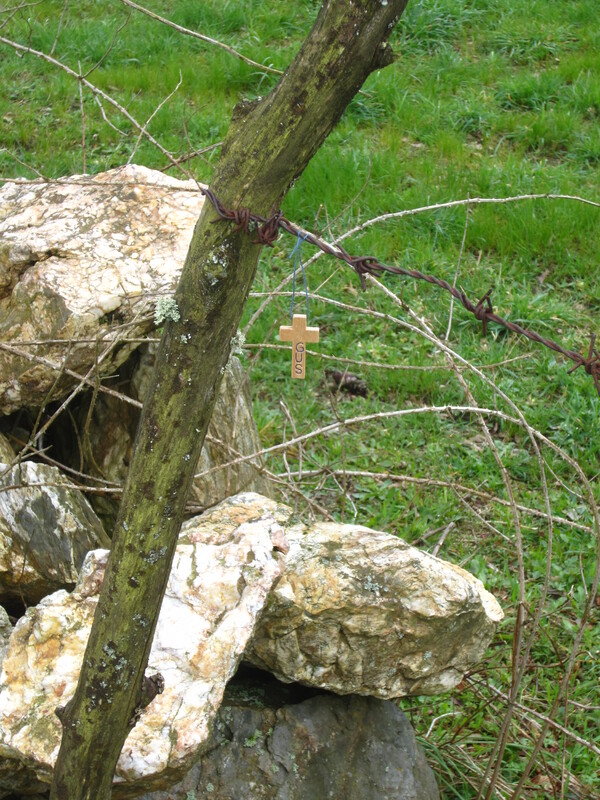 Even attaching Gus crosses proved to be a challenge as the wind swirled in all directions making Paul believe that he’d eventually wind up like War Horse – all tangled in barbed wire. The good news is that there was less mud and cow dung because most we took the route along the highway instead of through the rain-soaked forest. The bad news is that we could have lost our lives if any of those speeding trucks had hit us while their drivers were busy texting. We did make an interesting observation. We seem to be walking with more women than men. Women walking in large groups ahead of us, women walking in small groups behind us, women walking alone next to us. The few men we’ve seen so far seem to be walking with their wives. 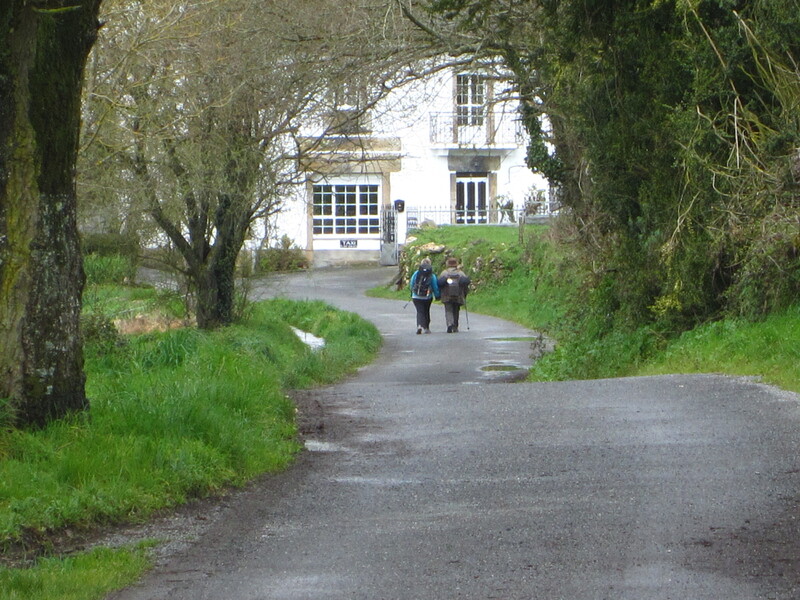 We walked behind a couple for a few miles that held hands the entire way – our hands were too busy with our poles and holding hands requires that you walk in step not a few paces ahead or behind each other like we do. 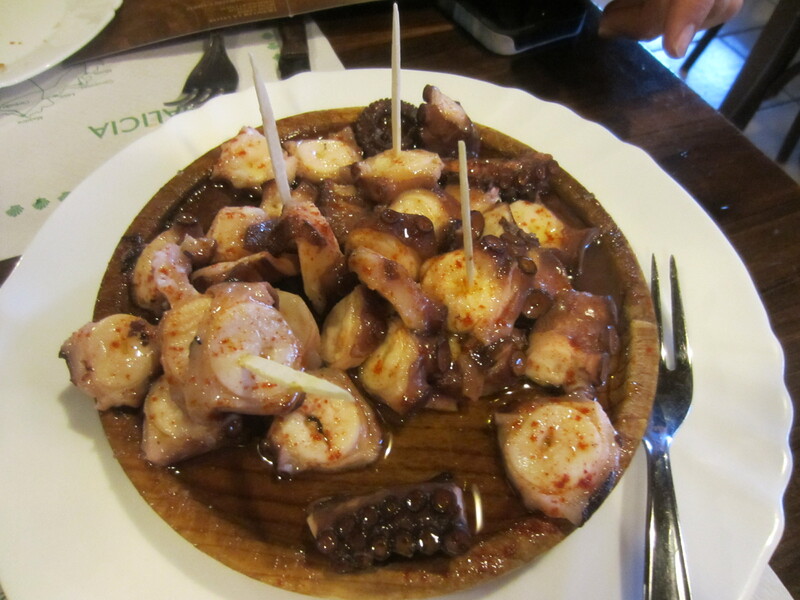 When we finally arrived in Palas de Rei, we rewarded ourselves with a fine meal, pulpo (octopus) sautéed in olive oil and topped with sea salt, a tray of fine Galician meats and cheese, sangria for me, beer for Paul and the most delicious cheese flan ever. 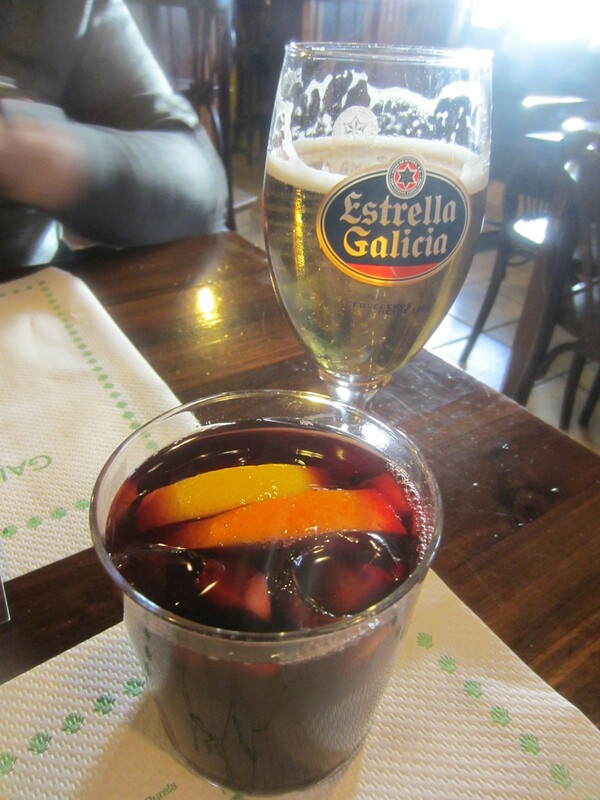 Sangria and beer for a walk well done. Good Morning from Portomarin. 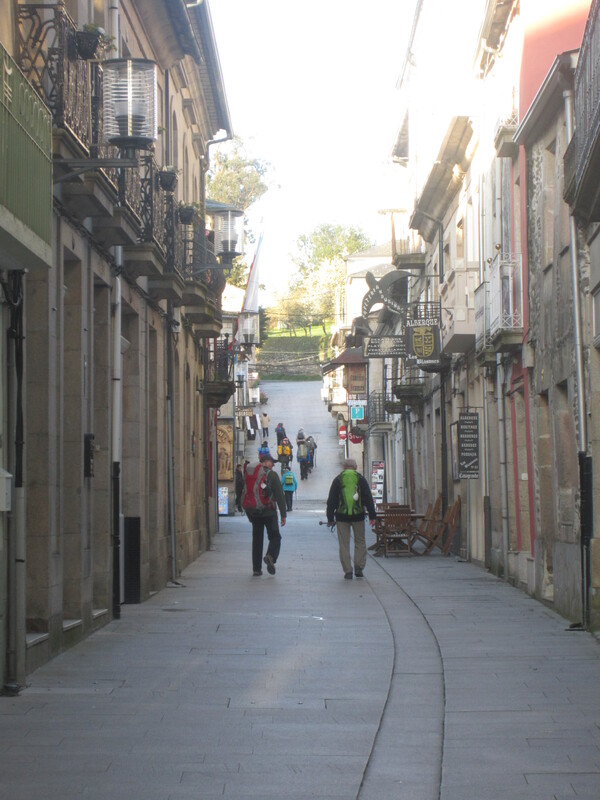 We hit the road in Sarria early yesterday with lots of other pilgrims. 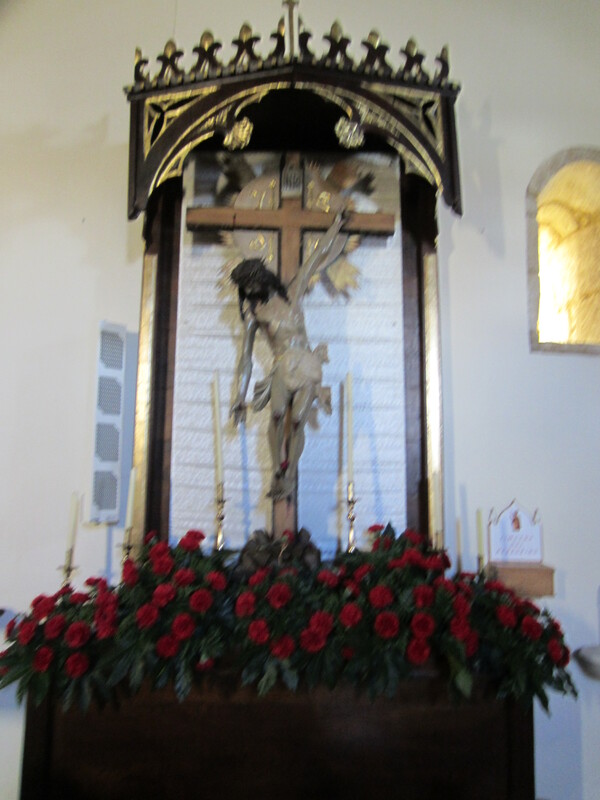 While they continued on, we stopped at a little church along the way. 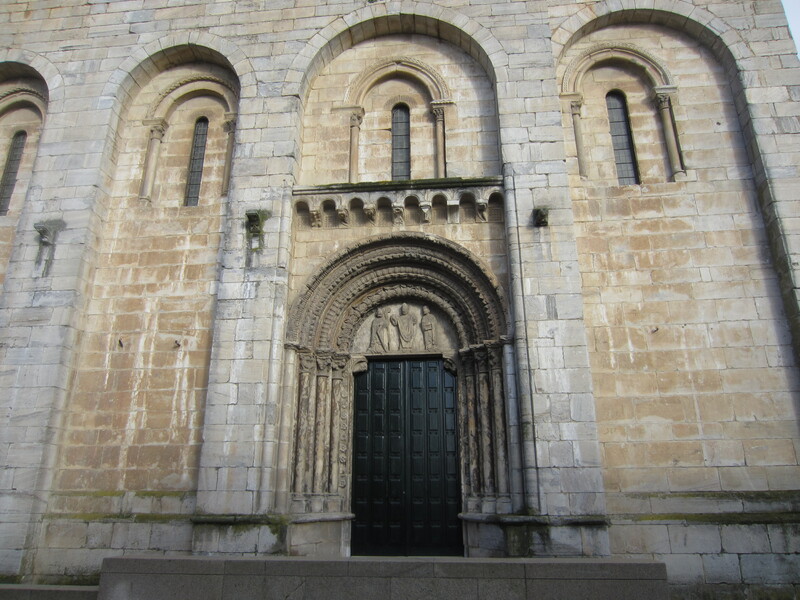 It was quarter to eight and the church was practically deserted except for another couple of pilgrims and a handful of elderly locals. We were about to leave, thinking we’d arrived too late for the early mass or too early for the later mass, when a little red Peugeot raced around the corner pulling up across the street. The priest jumped out fully robbed urging everyone to hurry behind him as though he had something more important to do than saying Easter Mass. But perhaps it was just that he wanted to start on time and he knew he had to give his bell-ringer, a hunched over man in his mid to late eighties time to shuffle from his seat at the front of the church to the back to the ring the bell and to the front again before he could start. With the bell dutifully rung, he took a breath and finally looked around the room. He seemed thrilled to discover that with the addition of the four pilgrims his audience had swelled to a full ten people and proceeded to give a funny and inspiring sermon. Filled with new hope (at least I was since I understood the sermon and my translations for Paul were choppy and very behind), we started on the road. 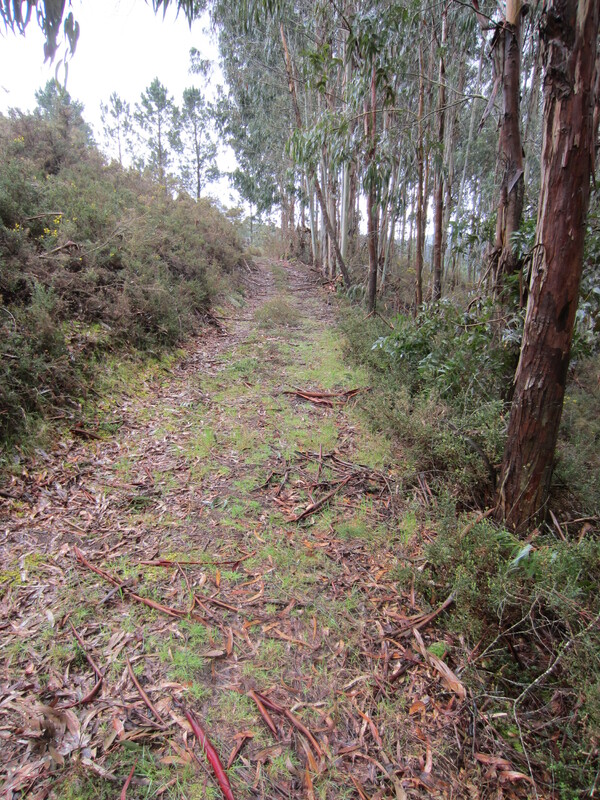 For the next seven hours we went up and down hills, up and down stairs, trudged through mud, sludge and cow droppings, while trying to make sure we did not miss the yellow arrows or scalloped shells that pointed us along the path. It was as beautiful as it was tiring. This morning however we are refreshed and ready to go. As we sit here having our breakfast of toast and cheese, what started off as a rain is dissolving into a beautiful bright blue day. We read somewhere that when things go your way – in this case we’d asked for decent weather – it is by intervention of St. James. So thank you St. James. We will walk another 17 miles today. See you on the other side. 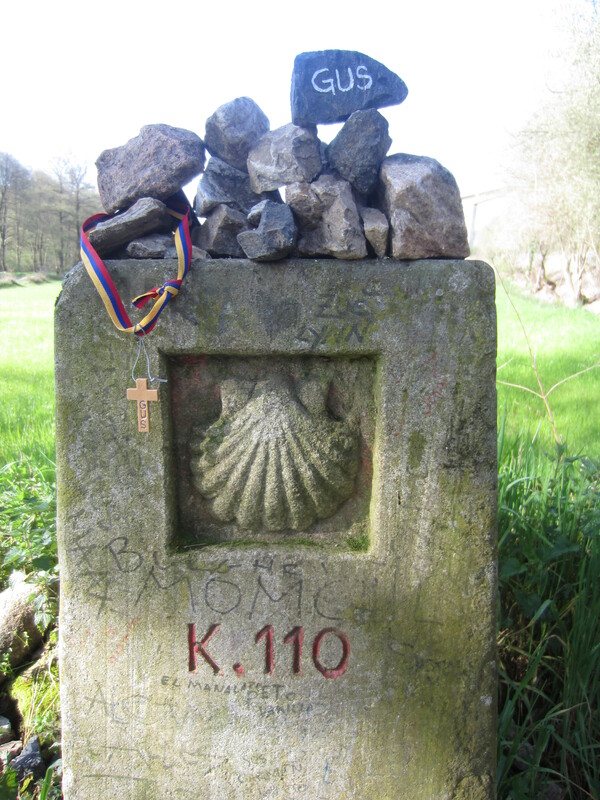 Pilgrims leave rocks at the kilometer signs. We left a rock with Gus’ name and hung a cross. 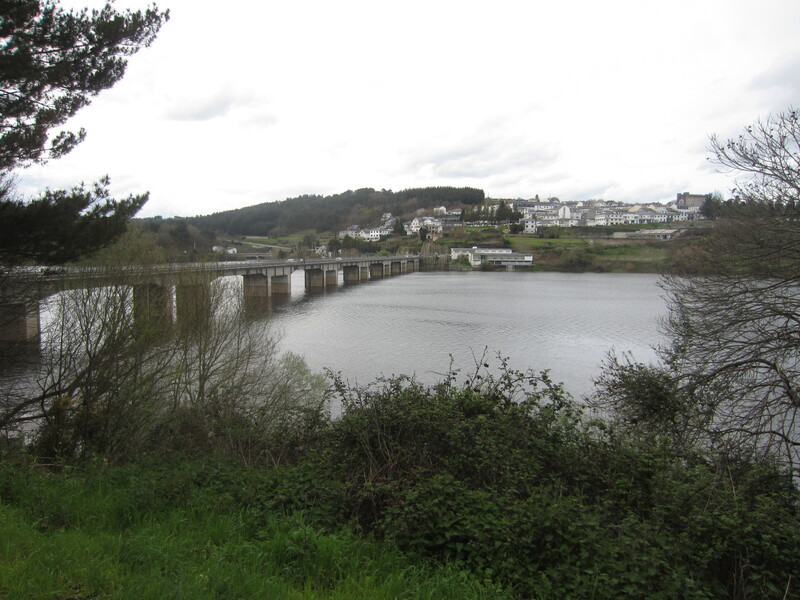 Portomarin is just across that bridge!